Sloppy defense, Predictable Play-calls, Namaste Oregon… For now. The Arizona Wildcats gave Oregon a second half punch they just couldn’t handle. After a bye weekend, the Ducks, ironically, rebounded with their most lethargic performance of the season. With the Ducks giving up a total of 208 yards and three touchdowns on the ground, Arizona’s running backs nearly went untouched off the tackle every play, capping the Wildcats’ 31-24 upset win in Autzen. Despite the upset loss that exposed Oregon’s weaknesses, there’s certainly no time for the Ducks to mope. Up next is an away game against No. 18 UCLA, which also suffered an upset loss at home against now No. 24 Utah. Both teams will be looking to flip the page and get back on track with an important conference win. While cringing to think that the Ducks could lose two in a row, if Oregon were to lose to UCLA next week they would still have a great chance to represent the Pac 12 North in the conference championship game. Because the Stanford Cardinals have already lost a conference game, if Oregon beats Stanford, both teams would have two losses, with Oregon having the tiebreaker! However, Oregon most likely will need to go undefeated for the rest of the season if there are any hopes to reach the playoffs. 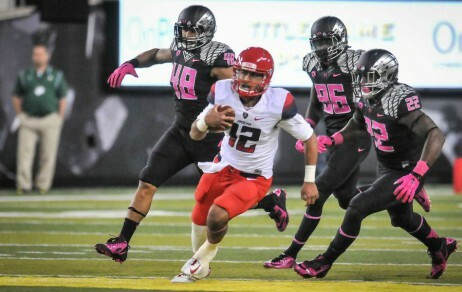 Arizona as a team ran for over 200 yards and three TD’s against Oregon. Oregon, Alabama, Oklahoma, Texas A&M, UCLA: welcome to the outside of the college football playoffs. It’s clear that no team is truly safe this year as there seems to be no single team that stands out on top. Yes, No. 1 Florida State and No. 2 Auburn are still undefeated, but all that can change quickly. After this week’s game at Syracuse, Florida State will face its final true test of the season. A home game against No. 6 Notre Dame will likely determine the Seminoles’ season. If they defeat the Fighting Irish, it seems quite likely they will run the table and claim the No. 1 spot. The SEC West is arguably stronger than any conference in the nation. Ole Miss (by upsetting Alabama) and Mississippi State (by dominating Texas A&M) have moved into the No. 3 and 4 spots, respectively. However, Ole Miss now has to travel to play a dangerous Texas A&M team, while Mississippi State will host Auburn this Saturday for College Gameday. Because this division is so highly competitive, it’s possible that it could land two teams in the college playoff, depending on how it plays out. Don’t expect any team to be safe in that division though. TCU has now entered into the conversation as well, thanks to an upset win over Oklahoma. Bolting up to the No. 9 rank, TCU now must defend its statement win as it heads to Waco to face the undefeated No. 5 Baylor Bears, who are also in the playoff conversation. 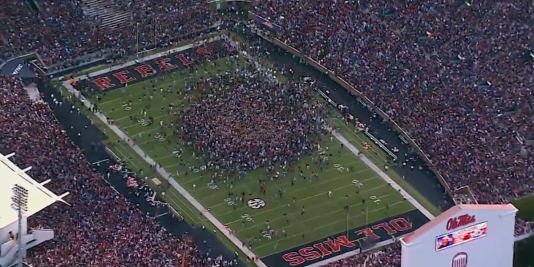 Ole Miss fans stormed the field after their 23-17 upset win over Alabama. With both Oregon and UCLA losing, there’s clearly no favorite to win the Pac 12. Even with Arizona’s impressive road victory in Eugene, it seems unlikely that the Wildcats will be able to run the table in this competitive conference. If they are able to win out however, the Wildcats will certainly deserve a spot in the college playoffs. Utah claimed a spot among the AP Poll’s top 25 after its win in Pasadena, and will undoubtedly be a difficult road task for Oregon on November 8. Stanford traveled to North Bend this past Saturday to face longtime rival Notre Dame. With the game tied at the end of three quarters, Notre Dame scored in the closing moments to win 17-14. The No. 25 Cardinal still remain the Ducks’ toughest competition in the Pac-12 North, and the winner of their November 1st matchup will likely represent the North Division. Arizona State pulled off an incredible 38-34 win in the Coliseum to knock USC out of the Top 25. Their last second 46-yard Hail Mary TD was one of the weekend’s top highlights. Up next for the Trojans is an away game in Tucson where they will try to take down the undefeated No. 10 Arizona Wildcats. Oregon State slipped past Colorado with a 36-31 win in Boulder. Up next for the Beavers is a home game versus No. 24 Utah. 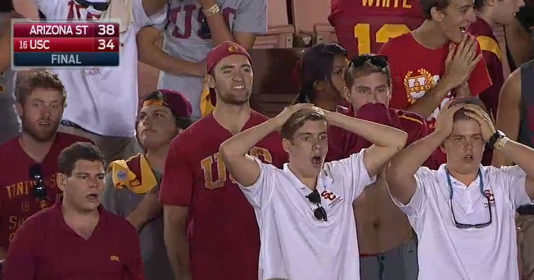 USC fans were stunned after Arizona State scored on a last second hail mary to win 38-34. 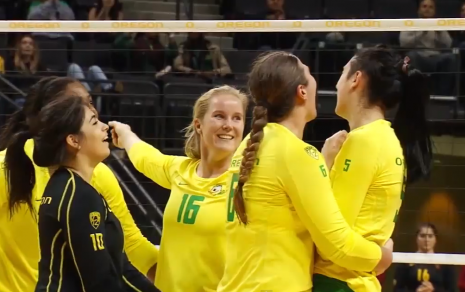 Volleyball – After suffering their first loss of the season, the Oregon Ducks volleyball team responded with a strong three set sweep of California. On Friday the Ducks took on No. 1 ranked Stanford. Despite losing in four sets, the young Ducks team impressed by remaining close in the first set and winning the third set against the nation’s top team. In Sunday’s win against Cal, the Ducks put up their highest offense efficiency performance of the season. Up next are matches against Washington State and Washington on Friday and Sunday at Matthew Knight Arena in Eugene, Ore.
Oregon Volleyball won a three set sweep versus Cal after losing to No. 1 Stanford. Cross Country – The third ranked women outlasted No. 4 Stanford this past weekend in the Washington Invitational in Seattle. The Ducks won with 48 points followed by Stanford’s 55. No. 15 Washington finished third with 119 points in a contest that also included No. 13 Villanova, No. 17 Boise State and six other schools. The men’s team ran at the Charles Bowles Invitational at Willamette University this past weekend and recorded a near perfect team score of 16. Chico State placed second with a score of 40, while Willamette was third at 131. University of Oregon runners Cole Watson and Tanguy Pepiot placed fourth and fifth, respectively, in the event.